Access to Transit refers to the ability to get from a place of origin to a location/stop where one can take advantage of public transit services. 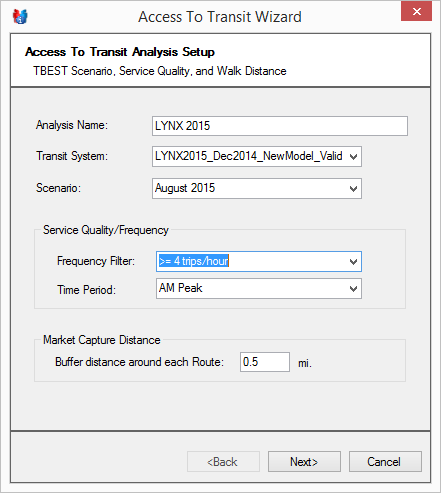 In the context of the TBEST Access to Transit toolset, access is measured based on a user defined distance from home, work or other place of activity to transit stops. 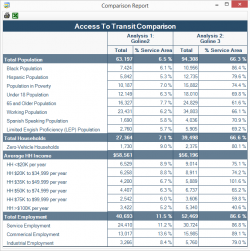 An access summary provides agencies with detailed demographic information on activity with walk access to transit based on all transit service or user-defined service quality thresholds. 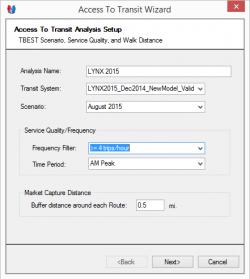 The TBEST Access to Transit toolset is constructed to provide socio-economic characteristics of population within user-specified walk access to transit. The creation of an Access to Transit Analysis is guided by a wizard-driven interface. The Access to Transit process engine summarizes socio-economic characteristics within walk access to either existing or proposed transit service networks. 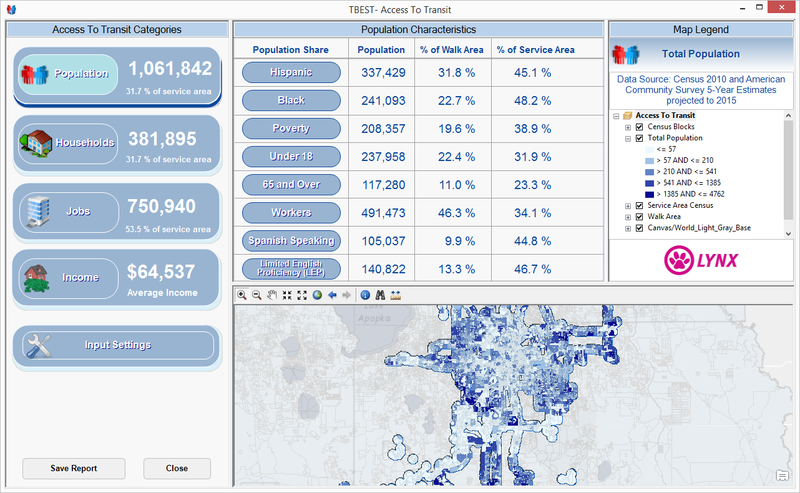 The Access to Transit analysis results are displayed in an interactive and easy-to-interpret Access to Transit Summary dashboard interface. The interactive dashboard’s Summary Bands allow users to quickly discern the extent of walk access population, households, employment, and income-levels relative to the service area totals. Detailed walk access demographic information and map distributions are also available by clicking on a summary band or by clicking individual demographic summary buttons. 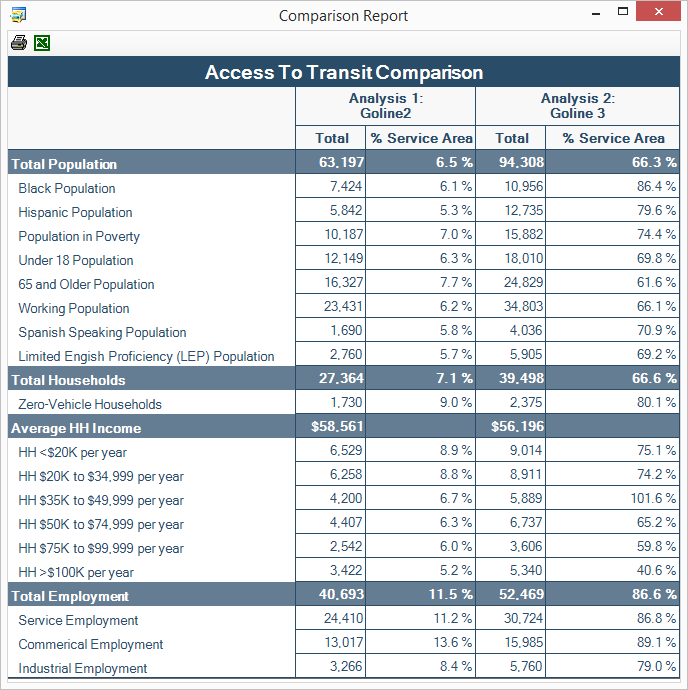 The TBEST Access to Transit workflow support tool also provides an interactive report interface for comparing various Access to Transit summaries. The Access to Transit Comparison Report summarizes multiple Access to Transit results enabling users to easily determine the relative impact of system changes on walk access markets. By clicking report content, users can access specific map content within the Summary Dashboard which corresponds to the selected analysis result and socio-economic variable.